Sun FireDefense’s SPF 3000 Flame Resistant coating is a post-treatment, interior/exterior fire retardant via a silicone ceramic coating that provides insulation and reflects heat up to 3,000 degrees F.
More than 50 percent of homes destroyed in wild fires aren’t in the direct path of the fire. Burning embers that float for miles and land on rooftops and find their way under eaves cause most homes to burn. Sun FireDefense’s SPF 3000 Flame Resistant coating is a post-treatment, interior/exterior fire retardant via a silicone ceramic coating that provides insulation and reflects heat up to 3,000 degrees F. The coating protects exterior and interior woods, such as maple, mahogany, cedar shake shingles, open-air roof decking and structural lumber. 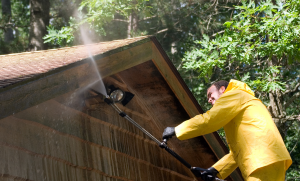 The clear spray lasts seven to 10 years and has a five-year warranty for exterior and seven-year warranty for interior wood applications. H&F Manufacturing Corp.’s PHASE-2 PVC panels have been FM approved. Industrial and commercial companies around the world rely on products that are FM Approved and specification tested to protect their properties from loss. The FM APPROVED mark, which is backed by scientific research and testing, ensures that the product conforms to high-quality industry standards. Since 1992, H&F Manufacturing Corp.’s PHASE-2 PVC panels have been FM approved for “unlimited wall height and a Class I certification, not requiring automatic sprinkler protection.” In addition, the PHASE-2 PVC panels earn a non-combustible flame spread rating of 12. Mainly used for siding, roofing and louver panels, PHASE-2 PVC panels provide unique and versatile solutions for a vast array of industrial and commercial applications.